I'm looking to track down and purchase any remaining bottle of MULLIGAN WHISKEY LIQUEUR that might be out there, as a gift for my boyfriend's 40th birthday. He tasted it some time ago in O'Loughlin's pub in Ballyvaughan and has been raving about it ever since, but when we went back there recently they said they had finished their last bottle of it and believed it was out of production. From internet searches I thought it was 'Mulligan Scotch Whisky' but the Celtic Whiskey Shop on Dawson St in Dublin said it was Irish, produced by Irish Distillers originally but they stopped doing it and it hasn't been bought over by another brand. Yes, this has been out of production for some years ... all you can do is hope some of our members may have a bottle or 2 stashed away. If I remember correctly it was a liqueur whiskey made with honey and pubs often used it for hot toddies. They also had one called Snug in an identical bottle (Different label) especially for hot toddies which I think included lemon and clove essence too. Put in a saved search for it in ebay and you will be alerted if one comes up for sale. This is one I owned so people might remember but fear I gave it away, I'll have another look though. There are alternatives to it which might suffice or at least worth a try. IrishWhiskeyChaser thank you so much for this detailed response! I now have a photo which will greatly help my search, and I will take your advice re. Ebay. Will also look into Dubliner and Bushmills Honey whiskey liqueurs as alternatives. 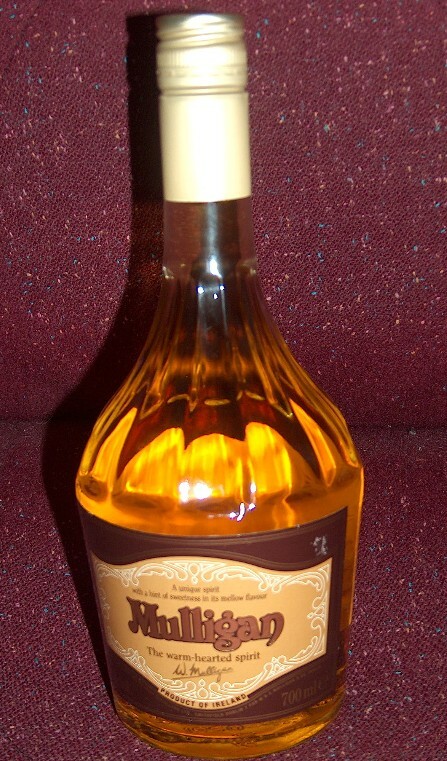 We did try some Glayva http://www.thewhiskyexchange.com/P-5237.aspx but it was that bit too sweet for his liking. Many thanks indeed for your help. ps - If any of the forum members have a bottle of Mulligan's tucked away that they'd be willing to offload, do let me know! I have a bottle somewhere but it a square bottle I think. I don't recall ever opening it, but that's not a guarantee I didn't. Here's the one I was on about. I don't know which is the older one. IrishWhiskeyChaser wrote: Yes, this has been out of production for some years ... all you can do is hope some of our members may have a bottle or 2 stashed away. Thanks Z you saved me a search. Good Whiskey Hunting wrote: Here's the one I was on about. bottle -- Have a bottle stashed somewhere ! IDL again I think. Wow, some serious connoiseurs on this site! All very interesting information, many thanks. Hey Raven, any chance you could throw up a pick of the millennium version. Would love to see it ... Always been a fan Jim. What does ROSC stand for or mean???? Hi All I have 5 bottles of the original Mulligan warm hearted spirit square bottles. If anyone is interested let me know. Original box also (3 per box). Popped into Pettits Supervalue in Gorey today,to get out of the rain and spotted 3-4 dusty bottles of Mulligan on the shelf at €25 . charleymcguffin wrote: Popped into Pettits Supervalue in Gorey today,to get out of the rain and spotted 3-4 dusty bottles of Mulligan on the shelf at €25 . Did you purchase any? I was there a couple of years ago and they had Dublin Dry gin too. It's strange to see those after they've been delisted for so many years. I've still got a couple of bottles at home so I'm in no hurry to replenish my stocks. If it's there this long I'm sure it'll be there for a few more months. I dropped in Yesterday to pick one up and i couldn't find any. I asked the staff and they didn't know what I was on about. I did have some luck, I manage to find the Dublin Gin. There were 2 bottles left and had a good layer of dust so had been standing there for a few years. I guess it's swings and roundabouts. I'm happy with my find all the same. I also turn up a few old bottlings of Irish Mist, Paddy, Tullamore, John Power but you need to be quick or let me know your interest as many of my finding go to Canada and the States.